If you require further information on any of my Safari Packages, Special Projects, or would just like to know more about interesting African facts give me a call or drop me a line. It would be nice to hear from you. 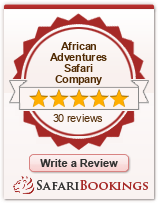 You will get a first rate safari with better service and a lower price by using African Adventures Safari Company. Put John to the test. The African elephant is the only mammal with a life span similar to humans?